In this reviewer’s humble opinion, the “Shrek” franchise had just about run it’s course after the second movie… but because nobody asked my opinion, they went ahead and made a third one, and a fourth is in the works. 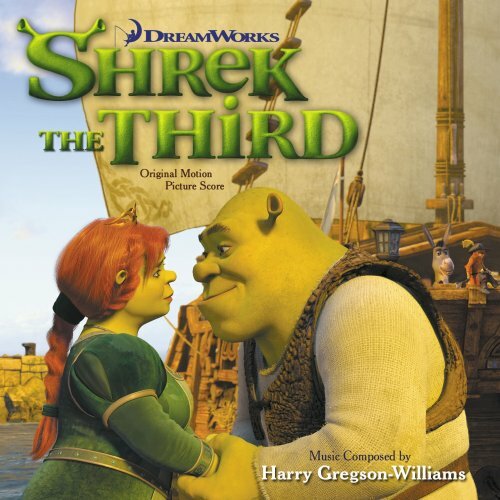 I was a fan of the original “Shrek” score, written by Harry Gregson-Williams and John Powell. It featured some genuinely delightful themes and a lot of creative energy. For the second film, Gregson-Williams went solo, and turned in a fairly uninspired effort that merely repeated everything from the first score in a generally less energetic manner. Gregson-Williams returned once again for “Shrek the Third”, and thankfully seems to be on top of things this time around. There’s a genuine sense of freshness to the score, as Gregson-Williams makes only passing references to the well-worn main themes. The emphasis this time is on creative energy, which is made very evident in the opening cues. “The Royal Treatment” is a delightful little faux-Baroque piece, while “Fatherly Dreams” underscore’s Shrek’s nightmare sequence with everything from horror references to Elgar’s “Pomp and Circumstance”. There’s really no standout great piece in the score, but every single selection is good, as Gregson-Williams seems to have written most of the score with a warm smile on his face. “The Frog King Dies” actually feels like it was written with genuine feeling, as opposed to routine emotional button-pushing. When the familiar “loneliness” theme turns up in “Another Adventure”, it suddenly seems fresh and new again, and so on, and so forth. Other highlights include the maniacal “The Hook Attack”, the Kill Bill-inspired “Princess Resistance”, and rather exciting “A Warm and Fuzzy Navel”. Maybe it’s the fresh warmth of the writing, maybe it’s the significantly better recording, or maybe it’s just my wonderful giving spirit… but “Shrek the Third” certainly sounds a lot better than I expected it to, and gives me a much-needed dose of encouragement in terms of the capabilities of Harry Gregson-Williams. A rather pleasant surprise, and at forty minutes, just the right length, too. It’s the best Gregson-Williams score in at least a couple years, and is recommended. Music composed and conducted by Harry Gregson-Williams. Orchestrations by Ladd McIntosh, Jennifer Hammond and Geoff Stradling. Additional music by Stephen Barton, David Buckley, Halli Cauthery and James McKee Smith. Recorded and mixed by Malcolm Luker. Edited by Richard Whitfield. Album produced by Harry Gregson-Williams.